Process Teknik is Sweden’s international fair dedicated to the entire processing industry, showcasing the latest solutions, products and technologies to better optimize new and existing processing lines. This 3-day exhibition held in Svenska Mässan, Gothenburg welcomed over 10,000 decision-makers and professionals, and facilitated a variety of seminars, workshops and ‘smart factory’ experiences. 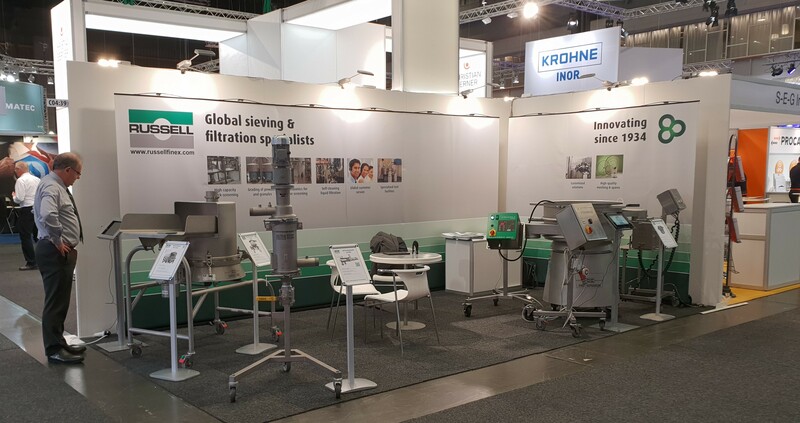 This has been another successful year for Russell Finex at Process Teknik, with industry professionals from all processing industries viewing and enquiring about Russell Finex sieving and filtration equipment at Stand C04:39. On display was the Russell Compact 3in1 Sieve™ used for safety sieving hand fed ingredients, fitted with a magnetic separator to catch all ferrous particles. The Finex Separator™ is used for grading and classifying both wet and dry materials. This vibratory separator was fitted with the Vibrasonic® Deblinding System to eliminate product blockage, the Russell Screen Changer™ for easy and safe accessibility to mesh screens, and the Russell Vibrastop™ for reduced movement of vibratory sieves. The third machine on show was the Self-Cleaning Russell Eco Filter® used for removing any oversized contamination from all liquid products.